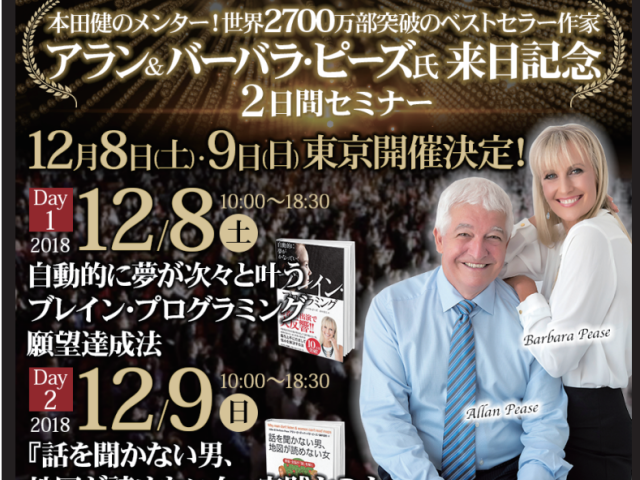 International bestselling authors of "The Answer, The Definitive Book of Body Language" and "Why Men Don’t Listen and Women Can’t Read Maps," Allan and Barbara Pease, have sold 27 million books, and have become a phenomenon in the world of personal development. On Dec 8, they will give their lecture about training yourself to be goal-oriented, titled "Brain Programming." On Dec 9, they will give another lecture about communication in relationships titled "Why Men Don’t Listen and Women Can’t Read Maps." The events will be hosted by Ken Honda, a hugely influential writer and speaker, with 7 million copies sold on the topics of money and happiness. He is the host of the podcast Dear Ken. This a rare chance to experience a radically inspiring and wildly entertaining seminar event with Australia’s foremost authors on communication and relationships. "Brain Programming" is about training your brain to be goal oriented. Without a clearly defined goal, humans are motivated by the next thing that happens, which, statistically will be negative or non-productive. With a clearly defined goal, you are motivated to step around, jump over or deal with obstacles that arise. Their 2nd day lecture "Why Men Don’t Listen and Women Can’t Read Maps" discusses how to improve interpersonal relationships by becoming an expert communicator. Barbara and Allan Pease travelled the world investigating evolutionary biology, analyzing psychology research, and studying social changes. Their book by the same title is a No.1 international bestseller. The couple has written 10 No. 1 bestselling books which have been translated into 55 languages and sold over 27 million copies. Their work has been the subject of a television series, a film, and stage plays. Allan Pease is a body language expert who has been consulted for advice on personal image by business executives, prime ministers, TV presenters, and rock stars. Ken Honda is one of Japan’s most active writers and speakers. His work is helping people to develop healthy relationships with their careers and with their money. His book "The Millionaire’s Philosophy for Happy Life" was a mega bestseller and he continues to write in both English and Japanese on emotional intelligence and wisdom for a happier, more free way of living. Ken’s first original English Language book, "Happy Money" will be released in June 2019. Day 1 (Dec 8): 10 a.m. - 6:30 p.m.
Day 2 (Dec 9) 10 a.m. - 6:30 p.m.
To sign up for Day 1, Day 2, or both, please email event@kenhonda.tokyo with your name, email address, and phone number by Nov 30.